Why you need StatCounter if you use Google Adwords – Statcounter Blog. Author and publisher Ian Lamont has used StatCounter since 2006 to help monitor his blogs and publishing websites. He recently used StatCounter to identify suspicious click fraud activity associated with a Google AdWords campaign. We invited him to tell his story. 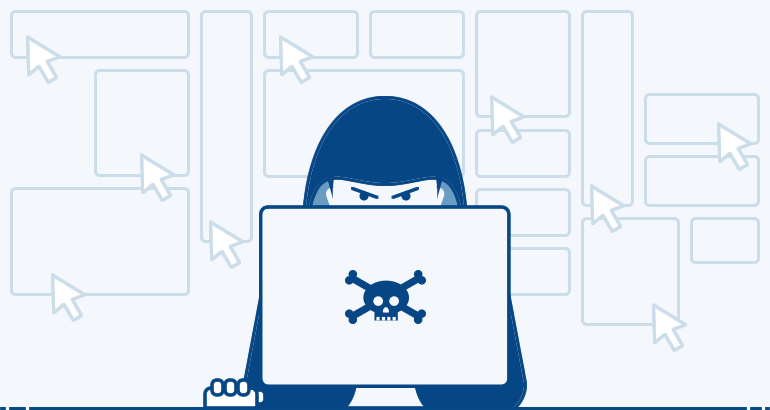 Digital advertising fraud is a big deal, siphoning off billions from advertisers each year. However, mobile and online ad fraud is not just an issue for big-box retailers, Hollywood movie studios, auto manufacturers, and other giant companies which depend on digital advertising to drive sales. Small businesses can also get cheated, and may not even know it. Even worse, the tools provided on Google’s popular AdWords service are wholly inadequate to detect the problem, and are actually likely to increase the likelihood of becoming a victim. In the following post, I will describe how I used StatCounter to detect suspicious clicks on a new AdWords campaign for a new book, and the steps I am taking to limit fraud on all of my Google AdWords campaigns in the future. I own a small publishing company. In addition to publishing how-to guides, I recently released a new book titled Lean Media. The book outlines an innovative framework that can help media managers and creative professionals eliminate waste, focus creativity, better understand audiences, and ultimately create media that matters. In order to boost sales of the book and better understand my own audience, earlier this month I created a Google AdWords campaign to drive traffic to the Lean Media website. I started the AdWords campaign the same way thousands of small businesses and entrepreneurs do every day: I went to adwords.google.com, clicked the button to create a campaign, added dozens of keywords, and devised a few book ads based on simple slogans and calls-to-action. Like most small businesses, I used the default location and technical settings that Google recommends to create the campaign. I discovered that by doing so, I had inadvertently opened up my business to unwanted and expensive clicks and potential fraud. The first sign of trouble came not long after launching the AdWords campaign. Part of my daily online routine for more than 10 years involves checking my web analytics to see how my websites are performing. I operate about a dozen WordPress websites for my business and also have various personal blogs, mostly on Google’s Blogger service. My StatCounter subscription lets me quickly check the day-to-day performance of all of them, not only showing how many views and visits I am getting, but also where the people are coming from and how long each one stays. The site is so convenient and easy to use, that I almost never bother looking at Google’s bloated traffic-tracking tool, Google Analytics. StatCounter also delivers something that Google Analytics and the traffic features of Google AdWords do not share (except through convoluted workarounds) — the actual IP address of the visitors to my publishing sites and blogs. This is a key piece of information that helps me understand who my visitors are — for instance, whether they are using a residential Internet service provider or a mobile carrier, if they come from schools or government agencies, or even if they are working at a specific company. 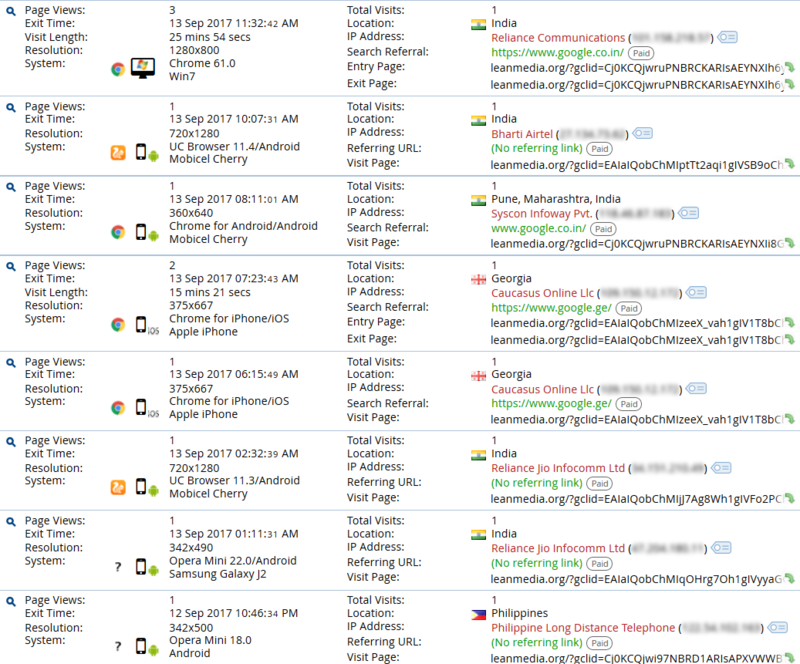 When looking at StatCounter logs for Lean Media, I was very surprised to see paid Google AdWords click (denoted by a parameter added to the URL that includes “gclid=” and a long text string) coming from India and the country of Georgia. There were no paid clicks from IP addresses in the United States. How was that possible? When I had created the book advertisements, I had been careful to select “United States” as the location. How could Google be showing my ads for my Lean Media book to people in India and a former Soviet republic, and why would people in Georgia even click on them, considering English is not widely spoken there? According to StatCounter, all of the paid clicks for the period in question were from foreign IP addresses, and none converted to sales. I opened up AdWords to examine the settings. Under the AdWords Dimension tab it’s possible to see limited information about visitors. When I viewed the AdWords Geographic panel, all of the paid clicks appeared to be from the United States, mostly in California. This seemed odd, as StatCounter clearly displayed locations outside of the United States as the source of the paid clicks. I called AdWords to find out what was going on. What I heard from the agent was surprising and very disappointing. He told me that setting the default location in AdWords to “United States” doesn’t actually limit audiences to people in the United States. Google also lets people from other countries who show an “interest” in the United States see the ads and click on them. “Lets say people with family in India or Georgia want to look for something to tell their relatives in the U.S.,” the agent said. He was serious. He explained that the non-U.S. clicks which Google considers to be valid are shown in the AdWords Dimensions > Geographic screen under the “Location type” column. I sorted the view so I could see which of the paid clicks were foreign vs. domestic. Many were labelled “location of interest,” meaning that even if the geographic location was supposedly in California, the person tapping or clicking the advertisement for Lean Media might be on the other side of the globe. This was not what I wanted. Further, I told him it looked very suspicious. For years, AdWords has been criticized for enabling all kinds of bogus schemes. You can see how some of them work on this page. I suspected I was the victim of a widespread scam in which low-quality publishers use Google AdSense or similar display networks on their web pages to display ads like mine, and then pay a small amount of money to get people, bots, or click farms (often located in other countries) to click on them, pocketing the difference between the cost to buy the click and the money they get from Google or other ad networks to display the ad. Advertisers like me end up wasting money on bogus clicks. Google is not incentivized to root out and punish such scams, because Google still gets paid by advertisers regardless of whether the click is real or fake. I didn’t believe for a second that random people from India or Georgia were clicking on the Lean Media ads because they wanted to tell relatives in the U.S. about my book. But Google’s agent didn’t care. He did not even acknowledge fraud was a possibility. Instead, he showed me how to change the default location so only U.S.-based visitors can see the ad. It’s done by going to AdWord campaign settings, and under Locations selecting Advanced options and changing the default “People in, searching for, or who show interest in my targeted location (recommended)” to “People in my targeted location.” There was no offer to refund the suspicious clicks. Moral of the story: If you’re a small business owner, don’t trust Google AdWords to look out for your interests when they conflict with its own interests to maximize paid clicks. And have StatCounter at your side to help you verify where AdWords visitors are actually coming from, so you can shut down avenues for suspected fraud and unwanted clicks before they eat up your online marketing budget. Ian Lamont is the author of Lean Media: How to focus creativity, streamline production, and create media that audiences love. Follow him on Twitter at @ilamont and @leanmediaorg. The views and opinions expressed by Ian Lamont are his own and do not necessarily state or reflect those of StatCounter. Hey it was really helpful article for me to understand Why we need StatCounter to use Google Adwords. very interesting thing, it is fit for anyone? grateful share. Thank you so much.